Today I’m going to review the Antique Shaker from Kitchen Cabinet Depot which can be found at kitchencabinetdepot.com. This was ordered around the winter holiday season so it took two weeks to arrive, which is hardly unusual given that shipping over this traditionally busy period takes a few extra business days. While going through this review, some of the aspects that are being critiqued will cross over into other sections. So how does this Antique White shaker shake up? The face-frame of the cabinet of the Antique Shaker, according to the Kitchen Cabinet Depot website, is a traditional five-piece frame (you can see the distinct inset tall rectangular panel that is distinctive of the Shaker style in the center) made of birch while the door and the drawer front is made of HDF (high-density fiberwood) composite, which is common in most RTA cabinets. The paint finish of the door is so smooth to the touch that for a moment, I thought it was molded to be that way rather than painted. No cracks or even visible wood grains in the finish of the door, but on this particular door, you can see a little excess paint caught between the inset panel and the door frame. While personally, I think this is charming because it’s proof of someone’s handiwork, it’s not exactly perfect but it still gets high marks. The Antique Shaker cabinet has a natural birch interior, which is the unpainted side of the plywood, for those that like a different exterior and interior to their cabinet boxes. According to the Kitchen Cabinet Depot, the natural interior has a UV coat. When touching it, it feels like there is both a thin layer of lamination on top of the wood, yet I can still feel the graininess of the plywood rather than smooth. So there is a layer, but it could use more of a layer. This Antique Shaker is composed of decent quality plywood at a ½ inch thick, which is what is expected in most RTA cabinets. 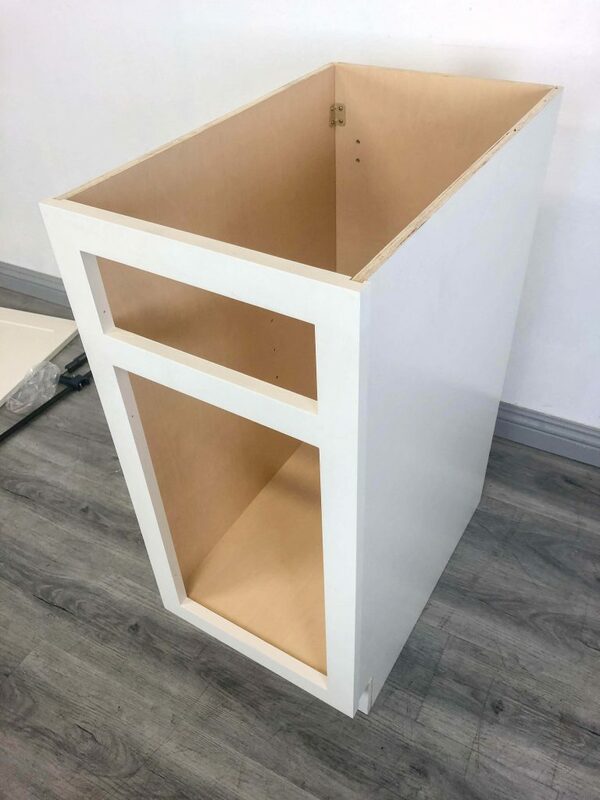 There is a full back panel which helps keeps the integrity of the cabinet structure so it does not cut corners on an area that the person does not see (at least when it comes to the cabinet box framework). Because this is what is expected in the average RTA Cabinet, it would get an average mark here but slightly more for the back panel. The drawer was so easy to put together, it was a pleasant experience. The sides of the drawer are a nice, thick 5/8 inches, which is surprisingly thicker than the sides of the cabinet structure at ½ inch. 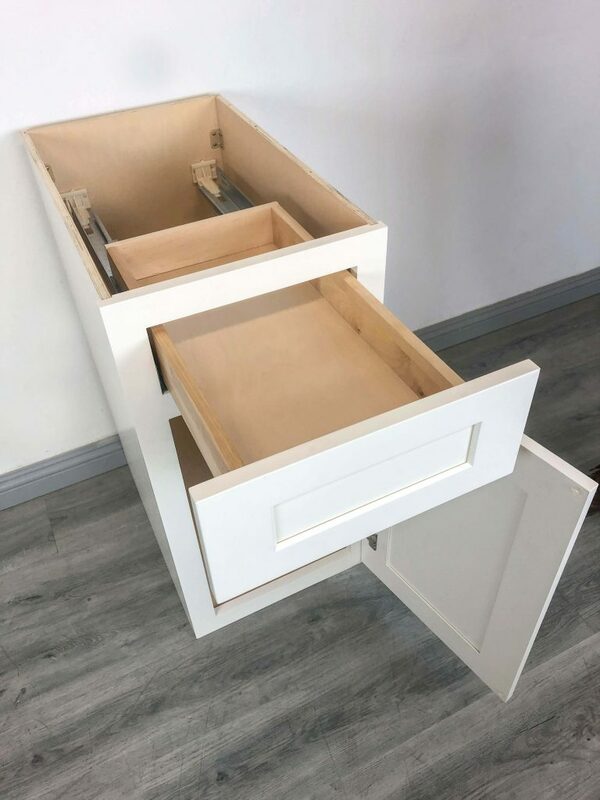 The drawer bottom is a slightly smaller 3/8” and can extend completely out of the cabinet structure without falling out of it. The panels have a light wood color with natural wood grain pattern and assembled together with dovetail joints. These dovetails are pretty secure; it only took a few bangs of a mallet to get them to connect and they have the right combination of tension and a smooth fit to lock things together. There is an adjustable shelf that is held in place by metal shelf clips, but it is only a half-shelf rather than a full shelf. The shelf itself is not very secure although the pegs are pretty tight in their peg holes and while practical, it feels like an afterthought than something purposely designed for the cabinet to get more added value. The drawer feels pretty shallow at 2 1/2” inches deep. To give you another perspective, that is one of my pinky fingers deep so that informs me that this drawer would be good for flatware and a few utensils, but I wouldn’t be able to even put a small cup into that drawer. But the drawer fully extends so that you can maximize the use of the drawer. The soft close door hinges that come with the cabinet operate smoothly. 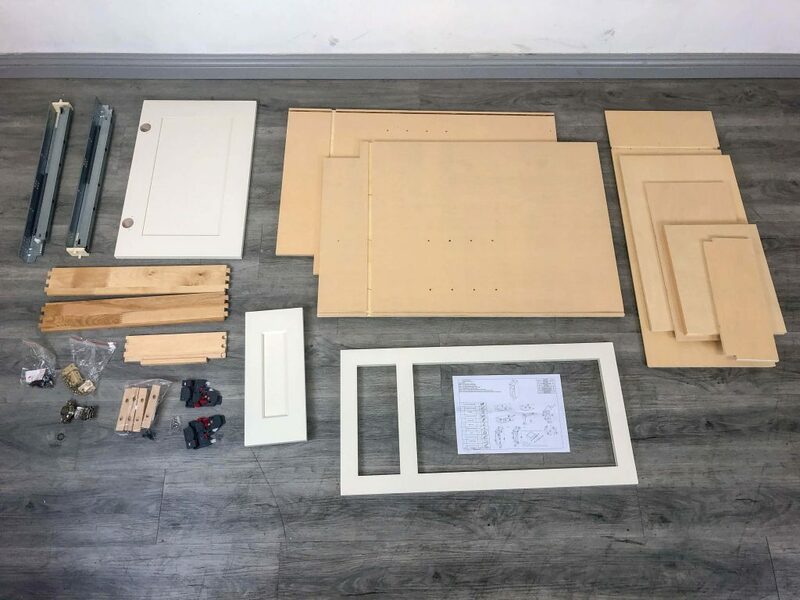 They have bases that are inserted into the circular sockets of the cabinet door and affixed to either side of the cabinet door frame depending on how you want to open the door. 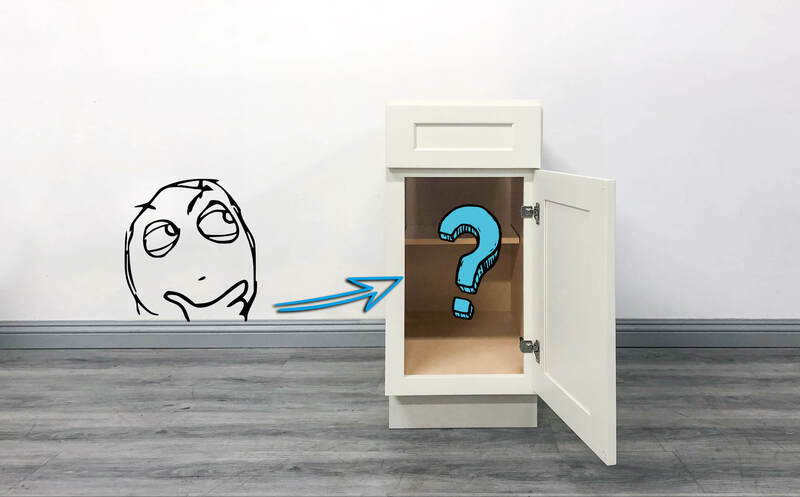 However, even though the soft close mechanism is smooth, there is a loud click whenever I close the door and that nearly defeats the point of closing a cabinet door with no noise. 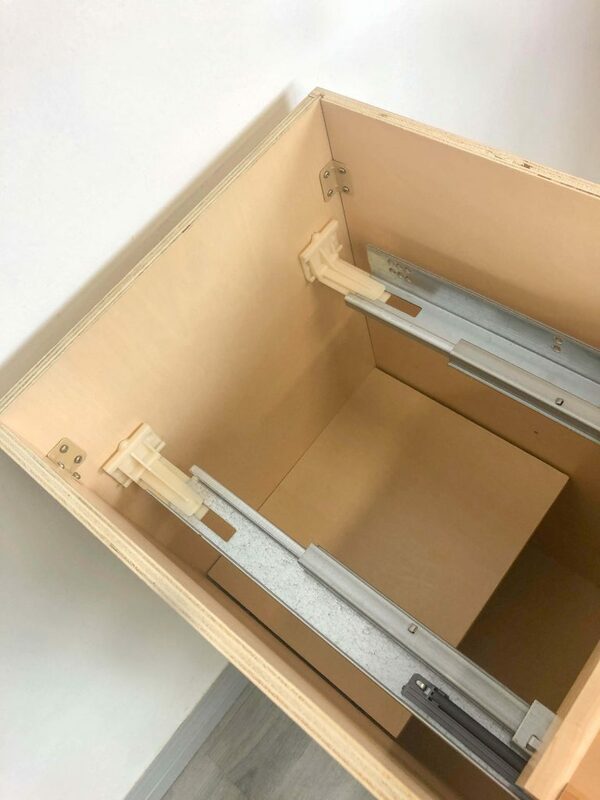 The drawer slides are mounted beneath the drawer for a smoother opening; the ends are attached to plastic latches at the back which are much better than rollers on the sides, that have the chance to derail and get stuck. When fully extended and pushed to close, there is a little bit of friction so it doesn’t have an effortless glide, but it is still rather smooth. Three of the screwheads broke off during assembly. One broken screwhead can happen by accident, two broken screwheads means the parts are substandard, three broken screwheads make me reconsider the quality of the whole cabinet. The fact that there were more extra screws in the package probably takes into account that this might be a normal complaint of the quality of these fasteners. This Antique Shaker arrived with good packaging in good condition; bubble wrap and layers of Styrofoam surrounded these pieces when unwrapping and the fasteners came in plastic bags. Any mechanisms like the sliders for the drawer arrived in cardboard boxes. The instructions were very basic and only a single page, but they are included. For the sake of the assembly, the instructions were followed according to the diagrams, which only had pictures, no text. It did not explain which fasteners were used in the assembly and almost presumes that you’ve done this before. These diagrams do not explain a very important section which was how to install the locking devices beneath the drawer. 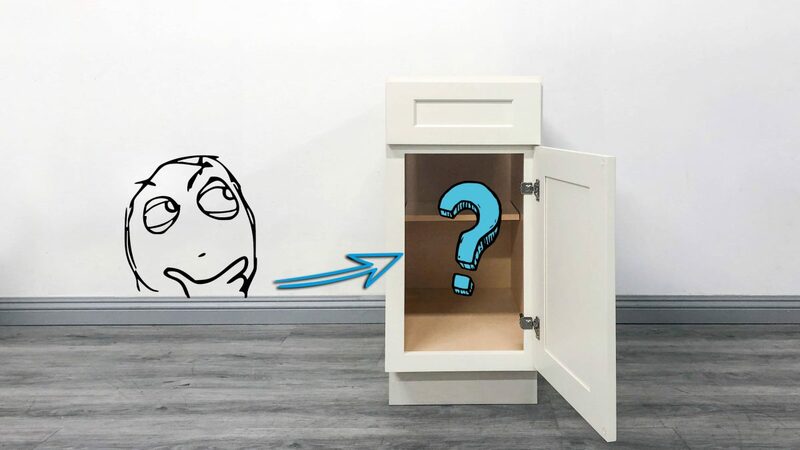 I had to look at another drawer’s construction with a similar locking device to figure this out and that’s not acceptable for instructions to be that unclear. On a couple of panels, the predrilled holes were misaligned and when shifted to align, three of the screwheads broke off. A Phillips head screwdriver is mostly needed for this RTA Cabinet Assembly, but a mallet will help with putting together the drawer connected with dovetail joints. I sent an email with a few basic questions and have not seen a response after a few hours. So it looks like your best bet is to either call them on the phone or do the live chat. So while according to the Better Business Bureau, Kitchen Cabinet Depot has an “A” rating, there are only a few negative reviews and no positive reviews, which is not unusual since most people tend to make complaints to the BBB rather than leave glowing compliments. However, the KCD Yelp! reviews have the exact same negative comments (as in copy and pasted) so either BBB is sourcing from Yelp! or vice-versa. 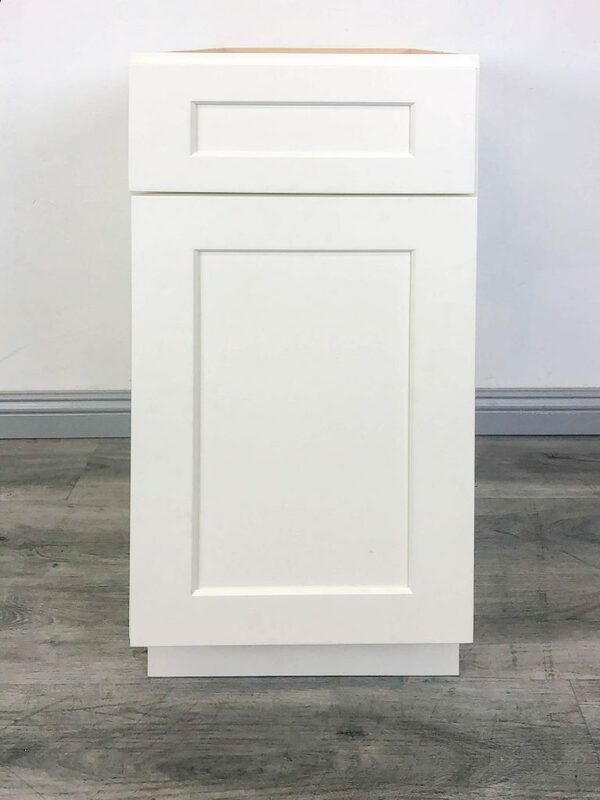 Looking at the Antique White Shaker from Kitchen Cabinet Depot, it’s interesting to see how much detail they pay to the exterior appearance but parts of the interior, including the assembly of the structure itself, are given less consideration. So if you want a cabinet that looks good, this is definitely a cabinet that serves that purpose. 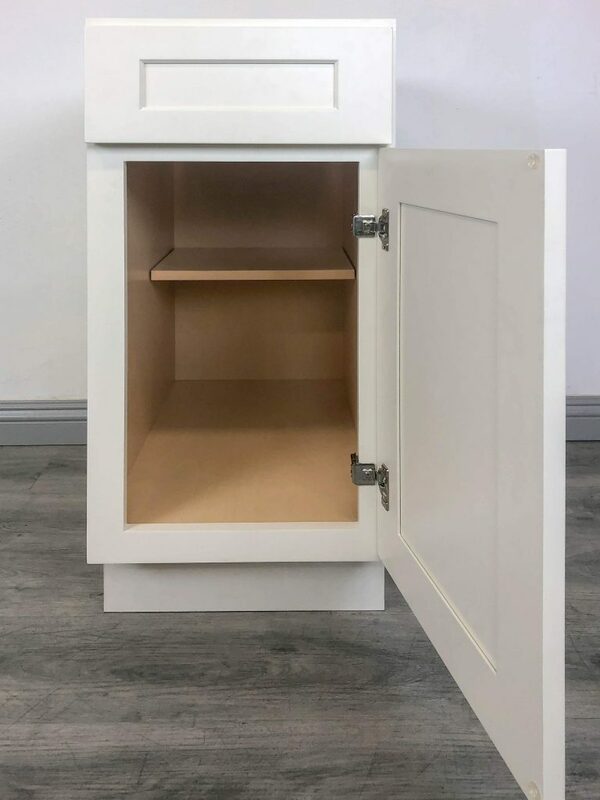 It is unusual that this kitchen cabinet has a drawer with side panels thicker than the plywood panels or the cabinet box and yet is more shallow than other drawers on the market. I would rather have slightly thinner drawers if it would get me more drawer space. Overall, this feels like a kitchen cabinet that would be rated “fair” as an average sort of cabinet. It can functionally and structurally be better, but it will look great in your kitchen design.